A man seems to have a perfect life with a lovely wife and child. His only fear is that she might leave him. Instead, they have a car crash whilst he’s driving. No one will answer his questions about his family, and he, overtaken with grief, tears out his IV and escapes. He ends up in the remotest part of the country, working in an airport landing strip, scraping a living, impotent with grief, scarred inside and out. He tries to shoot himself but can’t. He then finds out that his grief has done nothing but cause further pain, as his wife is alive, like him mourning his daughter, but also trying to understand why her man left her at her time of greatest need. 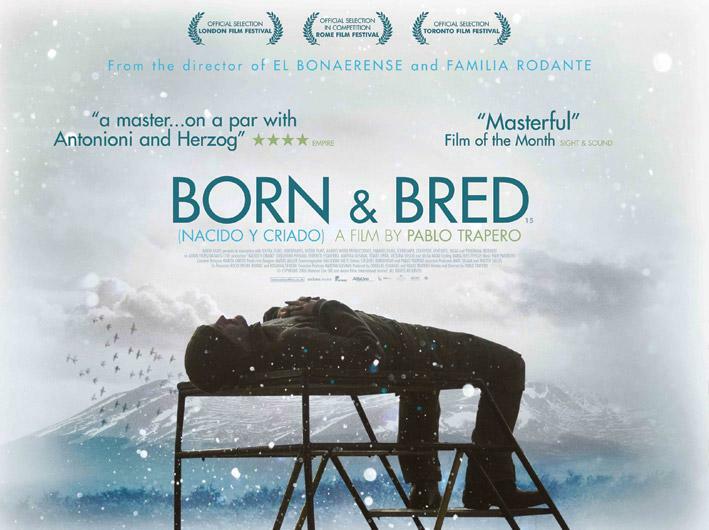 Born and Bred reminds me of Historias Minimas: the stark landscape, the spare style, the microscopic focus on feeling that magnifies audience understanding. Stories of men loving and suffering are still relatively rare and this one is very romantic in a very understated, masculine way. A very beautiful film. With Fernanda Almeida, Federico Esquerro, Martina Gusman.